I really wanna be over-rated. I’m not a loser and I ain’t no weeper. Won’t ever let up – Hope it annoys you! Join the pack, feel the crack! Well now you’re here – There’s no way back! — Quiet Riot, Bang Your Head. Director Darren Aronofsky bodyslams us for a three-count with THE WRESTLER, a modern masterpiece; controlled, poignant, inspiring, funny, ultimately heart-wrenching with a Ramjet dive off the turnbuckle. The Poff off the turnbuckle! All that wayward talk about Mickey Rourke winning Mr. Oscar is well-founded. 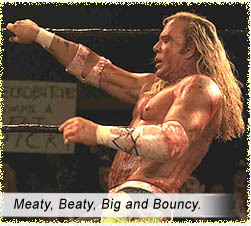 His performance as The Wrestler is music sweet music – specifically, 1980s hair metal. Not only does he pull the shameless Oscar Moments (“I’m a broken-down piece of meat… I don’t want you to hate me” – you’ve seen the trailers), he also does the most natural onscreen acting since the 1970s (think: JAWS or THE EXORCIST) – and that’s him in the ring, 100%, having spent four months drilling the discipline of the bodyslammer, performing all his wrestling stunts himself. A triple-threat performance so remarkable should be rewarded – even if it’s just the political hokum of the Academy Awards. At the time of this writing, he has already walked off with the Golden Globe for Best Actor. THE WRESTLER opens with posters of wrestler, Randy “The Ram” Robinson (Rourke), in a montage of his glamorous, storied career, while Quiet Riot’s Bang Your Head slams at the soundtrack; some posters feature his watershed bout with “The Ayatollah” at Madison Square Garden. Crash-cut to 20 years later in a lonely dressing room after an exhibition match, with Randy accepting a light pay packet (the usual managerial excuse “Not as many people as I thought”). He is down but not out, long dyed-blond locks, long in the tooth, long past his Use By date, yet punishing his body in small matches for small pay. With a Steadicam following so close behind him we can hear his labored breathing and count the wrinkles on his puffy, battered face, our first intimate adventure with Randy is him being locked out of his trailer (for late rent) after returning from a match, eventually sleeping in his Dodge van. Mickey Rourke has always had a body carved from unyielding rock; a background in boxing and self-abuse has brought him this wrestler’s meat-muscle frame. Though he was not Aronofsky’s first casting choice, The Wrestler IS Mickey Rourke – it is futile trying to imagine anyone else fitting this role as snugly. Rourke is not acting, just being. Though something seems very “wrong” and misshapen about that mountain gorilla frame, like it is being driven by will alone and one misstep will implode it. Randy is obviously the oldest still on the circuit, yet the camaraderie of the wrestler brotherhood is apparent – backstage, they all give him the respect he has earned. But in this “fake yet real” “sport” he is not fighting these young man-mountains anyway – he is battling his own failing body. Faced with potential death if he steps into the ring again, Randy reassesses his stagnant life and bleak future. He tries to stomach the nostalgic sludge of a reminiscence tour, but seated behind conference tables, selling memorabilia and his autograph for $8 a pop, putting on fake smiles for photos with redneck fans, won’t sustain his spirit. He is a Wrestler, only alive in the ring. Neither doctors nor time nor his body nor his heart can make him stop being one. As Quiet Riot’s Bang Your Head is his theme song, Quiet Riot’s career arc exactly defines Randy “The Ram” Robinson’s career. The band’s early 80’s Metal Health was the first metal album to hit Number 1 on the U.S. charts, followed by arena tours; twenty years later, Quiet Riot were playing small casinos and nudist colonies, and late 2007, founder and lead vocalist, Kevin DuBrow died from a cocaine overdose. THE WRESTLER is a tragic commentary for those who chance into the insular world of stardom; we have made no place in our shallow, blitzkrieg society for them to graciously decompress. Starring: Mickey Rourke, Marisa Tomei, Evan Rachel Wood, Mark Margolis, Todd Barry, Wass Stevens, Judah Friedlander, Ernest Miller, Dylan Keith Summers, Tommy Farra, Mike Miller.